The University of Colorado Boulder (commonly referred to as CU, CU Boulder, [a] or Boulder) is a public research university located in Boulder, Colorado, United States. It is the flagship university of the University of Colorado system and was founded five months before Colorado was admitted to the Union in 1876. In 2015, the university comprised nine colleges and schools and offered over 150 academic programs and enrolled almost 17,000 students. Twelve Nobel Laureates, nine MacArthur Fellows, and 20 astronauts have been affiliated with CU Boulder as students, researchers, or faculty members in its history. The university received nearly $454 million in sponsored research in 2010 to fund programs like the Laboratory for Atmospheric and Space Physics, and JILA. Currently Freshmen and others attending the University of Colorado Boulder have an option of 24 on- and off-campus residence halls. Residence halls have 17 varieties of room types from singles to four-person rooms and others with apartment style amenities. There are several communities of residence halls located throughout the campus, as well as in a separate area called Williams Village which is located approximately 1.5 miles off of main campus. There is a free bus service that transports students to main campus from Williams Village and vice versa. The University also offers Residential Academic Programs (RAPS) in many of its Residence Halls. RAPs provide students with in-dorm classes tailored to academic interests (international affairs, environmental studies, etc.). University of Colorado Museum of Natural History has one of the most extensive natural history collections in the Rocky Mountain and Plains regions, representing the disciplines of Anthropology, Botany, Entomology, Paleontology, and Zoology. It is located in the Henderson building, named after its first curator, Judge Junius Henderson, and hosts the Museum and Field Studies master's (MS) program. 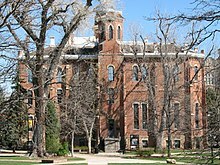 The CU Heritage Center  tells the stories of CU Boulder's past and present and is housed in Old Main, the first building constructed on campus. Seven galleries exhibit art and memorabilia associated with CU faculty and alumni. The Fiske Planetarium and Science Center features a 60 ft (18 m). planetarium dome and produces laser shows, live concerts, and an ongoing series of public programs. Fiske also offers a hands-on science museum with interactive exhibits and space-themed art. CU Boulder adopted an honor code in 2000 following growing concerns about academic dishonesty on campus in the late 1990s. A copy of the code stating "On my honor, as a University of Colorado Boulder student, I have neither given nor received unauthorized assistance on this work" is engraved on a metal plate and posted in every classroom on campus. As of 2006 [update], there were more than 3,800 tenured or tenure-eligible faculty members, as well as 4,400 non-tenured adjunct professors and instructors. Current faculty include Nobel laureates David J. Wineland (physics 2012), John Hall (physics, 2005), Eric Cornell (physics, 2001), and Thomas Robert Cech (chemistry, 1989). Carl Wieman was also awarded a Nobel prize for his work with Eric Cornell. He maintains a part-time appointment at the University of Colorado Boulder but his primary appointment is Professor and Director of the Carl Wieman Science Education Initiative at the University of British Columbia. Controversial writer Ward Churchill was a professor of ethnic studies until he was wrongly fired in July 2007. Robert T. Craig an International Communication Association Fellow and author of "Communication Theory as a Field" is a professor in the Communication Department. The CU Independent is the award-winning, student-run news publication for the University of Colorado Boulder. It has been digital-only since 2006, one of the first major college newspapers to drop its print edition. The publication has a staff of about 60 editors, reporters and photographers who are responsible for producing new content to update the website at least once a day during the fall and spring semesters. Most contributors are journalism majors, but other CU programs are represented as well. A managing editor and an editor-in-chief oversee the website. The CU Independent serves as a testing pad for community news and multimedia. Founded in May 1919, the Hiking Club is the longest running student organization at the University of Colorado Boulder. It is a non-profit, student-run organization for university students and affiliates interested in hiking and outdoors activities, with hundreds of active members on campus. The club motto, "half mile more", dates back to the 1940s of the club's tradition-rich history. A slide show  of the club's activities is shown on campus during semi-annual new member meetings and the alumni association meets annually. Founded in 1983 by Jim Castagneri, the team was taken to the national championships in 1987 by 1992 Olympian John Stenner. The CU cycling team frequently ranks in the top five USA Cycling Collegiate teams in both road cycling and mountain biking disciplines. They have won the national championship on several occasions, including 2005 where they won in both disciplines. From the club, many members have gone on into professional cycling, such as Tyler Hamilton. Established in 1953, Program Council is a student run group that coordinates concerts and movies played on campus throughout the year. Program Council mainly focuses on organizing concerts around campus. Over the years, this group has brought such acts as The Rolling Stones, The Who, Dave Matthews Band, Pearl Jam, R.E.M., The Ramones, and many more to the University of Colorado. Concerts vary in size ranging from large scale concerts, to smaller local acts, some of which are free to attend. Besides concerts, Program Council also hosts a film series throughout the year which allows students to see soon-to-be-released movies as well as cult classics for free in one of the large lecture halls on campus. The Herd is one of the largest student alumni groups in the nation, with over 6,000 members. The Herd's main goal is increasing school spirit. Therefore, the Herd encourages students to attend school activities such as sports games and club meetings. The Herd also sponsors discounted bus rides to the ski slopes, discounts around Boulder, and football pre-game parties. Sixteen student leaders run the group; the group is open to currently enrolled students. The Volunteer Resource Center is a student funded organization aimed towards promoting volunteerism in the Boulder community. They provide a database with volunteer opportunities of 250 organizations around campus and in the Boulder area. 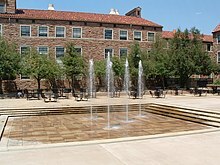 The CU Boulder campus was recently one of 3 U.S. Universities to receive the Presidential Award for Exemplary Student Community Service in 2008. The Volunteer Resource Center hosts or participates in special volunteer events and activities including Alternative Breaks, Better Boulder Better World, and The Buffalo Can Challenge. The Volunteer Resource Center also a yearly Volunteer Internship Program which engages six selected students through an interview process to create events aimed at involving more freshmen in volunteering, effectively managing all logistics of the event, and implementing the events on campus. Started in 2008 by CUBoulder students,  Left Right TIM is the Boulder area's premier and longest running improv comedy team, performing a weekly improvised comedy show every Friday during the University's academic year in the Hale Anthropology Building Room 270 of the school's campus. The team accepts new members every year and has performed in cities around the country as well as opening for established stand up comedians and improv theaters. [ not in citation given] On February 23, 2018, the group celebrated its ten-year anniversary. Sports teams at the school are called Buffaloes. The varsity athletic teams participate in the NCAA's Division I ( FBS for football, see Bowl Championship Series) as a member of the Pac-12 Conference. The school officially joined the Pac-12 on July 1, 2011, ending its affiliation with the Big 12 Conference. (CU had previously been a member of the former Big Eight Conference, whose members had merged with four schools of the former Southwest Conference to create the new Big 12 Conference in 1996.) The official school colors are silver and gold, as opposed to the common belief of black and gold. Silver and gold were chosen to represent the state's mineral wealth, but the colors did not look good together on the uniforms, so black was substituted. There are three official fight songs: "Glory Colorado", "Go Colorado", and "Fight CU." In the early 1980s, the Board of Regents changed the school colors to sky blue and gold; but the changed proved highly unpopular with students and alumni, and the colors were changed back after 1985. In football, CU enjoys an in-state rivalry with the Colorado State Rams in the " Rocky Mountain Showdown", a game that is played at the neutral site Sports Authority Field at Mile High. Additionally, Colorado and former Big Eight and Big 12 rival Nebraska Cornhuskers have played some notable games, often finishing their respective seasons in nationally televised confrontations on the Friday following Thanksgiving since the 1990s. This ended after the 2010 season as a result of CU joining the Pac-12 and Nebraska joining the Big Ten Conference. CU also includes a spirit program. The spirit program consists of three teams: two cheerleading squads, and the CU Express Dance Team. The cheerleading program consists of a competitive co-ed squad as well as a competitive all-girl squad. Both the cheerleading squad and the Express Dance Team compete at NCA/NDA College Nationals. In 2007, the cheerleading squad finished sixth  at NCA Nationals in Daytona Beach, Florida. All squads support the home games of football, Women's Basketball, Men's Basketball and Women's Volleyball teams, along with other athletic and social events. The school's live mascot is a female American Bison named Ralphie. The costumed mascot CHIP is also a part of the CU Spirit Program. CHIP is a costumed buffalo that represents the University of Colorado at numerous athletic and social events. Along with the Cheer and Dance Program, CHIP competes on a national level once a year against mascots from around the country, including Bucky Badger, Sparty, Aubie, Goldy Gopher and many other Hall of Fame mascots. Most recently CHIP competed in the 2009 UCA national competition and was crowned #1, and the national champion after performing a skit titled "CHIP's Favorite Video Games". The University of Colorado Boulder ranks fourth among U.S. universities in number of astronauts produced, not including military academies. 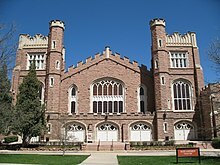 In addition, the University of Colorado Boulder has graduated two Heads of State: Mongolian President Tsakhiagiin Elbegdorj and Liberian President Ellen Johnson Sirleaf; and two associate justices of the Supreme Court of the United States: Wiley Rutledge and Byron White. Indian-American astronaut Kalpana Chawla was also an alumna, as was the filmmaker and director Monty Miranda. ^ "About" CU Cycling Team. Web. August 5, 2011. < http://www.cucycling.com/about.php Archived January 13, 2012, at the Wayback Machine>."